Last Wednesday, I let myself be late from work because I wanted to cook. I had my eyes on the prawns we left when MIL cooked sinigang na hipon last stormy Sunday. Since days are passing, I was thinking that the prawns are loosing their freshness already. So I woke up early, 6AM (ok, I know that most people are already off to their work at this time. Me – usually, I’m still in bed with Ayex). I took the frozen prawns and placed then in a container then I put cold water in it so the ice would melt. Then back to our bed. Hahaha! Anyways, except for the forgotten quail eggs, the dish went well. Here’s how to do this recipe. 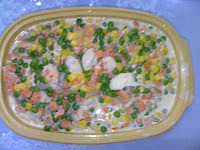 If the prawns and the mixed vegetable are frozen, let the ice melt by putting then in tub with water. When the prawns are already in their natural state, put them in a medium casserole, add water then let them cook until half-cooked. While the prawns are cooking, prepare the garlic and onion. Cut them in the same way you do when you’re sautéing. When the prawns are cooked, remove them from the casserole but don’t throw the soup. Remove its skin, cut into two from its back then remove the black thing in its spine. After that, you can cut each half into two or three pieces depending on the size of the prawn. Heat the pan. Once it’s hot, put the butter and let it melt. Then put the garlic. Once the garlic are brown, put the onion, let it cook. 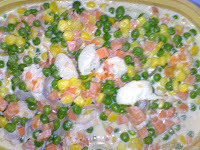 Put the mixed vegetables and then mix well so everything will be buttered. When the mixed vegetables are already half-cooked, put the nestle cream. Add 1/2 cup prawn soup (the one where you boiled the prawns) then put the prawns. Mix so the prawn is not only on the top of the mixed vegetables. Simmer for 5 minutes then serve. You can also substitute the prawns with quail eggs or they can be together.